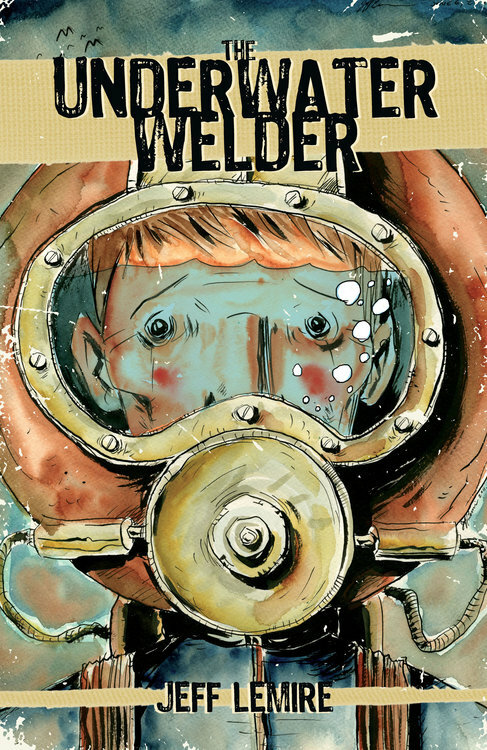 We had the opportunity to read, and review The Underwater Welder by Canadian comics artist Jeff Lemire…. and the folks at Arc-Zone are giving this graphic novel two thumbs up! Jack returns to Tigg’s Bay, the Canadian coastal town where he gew up, with a wife and baby on teh way. Since, as Jack puts it, “It’s hard to raise a family with an English degree,” he’s taken a job as an underwater welder for an oilrig off the coast of Nova Scotia. A job that keeps him away from his family for weeks at a time. As the anniversary of his father’s death and the birth of his son approaches, Jack is drawn more and more to his underwater workplace wehre he can “Just zero in on the weld itself…. [and] let everything else fade into the background.” But Jack doesn’t find the control he is looking for in the weld zone, instead he finds a doorway to his past, and to his future and he must decide: is he doomed to follow in his father’s footsteps? Lemire’s Underwater Welder dives into universal themes of loss, grief, love, and family with not only a compelling story, but with drawings that play with light and dark and add a layer of emotion that words alone cannot. In addition, it’s amazing what Lemire can convey with the simple line drawings of Jack’s eyes–even from behind the welder’s diving mask. If you’re interested in taking the plunge, the American Welding Society has a Guide to Starting an Underwater Welding Career online. If you’re just interested in Welding Like a PRO, and getting the welding accessories you need for your TIG, MIG, and Plasma Arc Welding application, check out Arc-Zone.com.